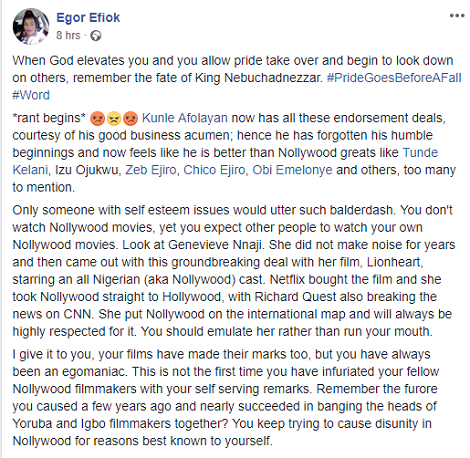 Nigerian film maker, Egor Efiok has reacted to Kunle Afolayan’s comments about not watching Nollywood movies. According to Egor,this is nothing but pride. Kunle Afolayan in an interview, had said he hardly watches Nollywood movies because he needs movies that would challenge him. ''… Truth be told, I hardly watch them because I am keen on watching movies that will challenge me and change my orientation about certain things. My children watch them a lot and that does not make them speak bad English'' the actor had said.